If you are there, at home or at work, and have $ 3000 left and wants to buy a futuristic product, well, it’s your time, you can already buy a HoloLens, holographic computer that runs Microsoft Windows 10. Even costing more than $3000, the HoloLens should sell well, and the reason is that we are talking about the future and many companies have great interest in this innovative product. Of course it will be difficult to see anyone buying one of these. Its focus are companies and advanced developers, because the kit that is for sale in the Windows Store is just the kit for developers, so we’re not talking about a completely finished product that can be used in the living room of his home, his focus are still developers. 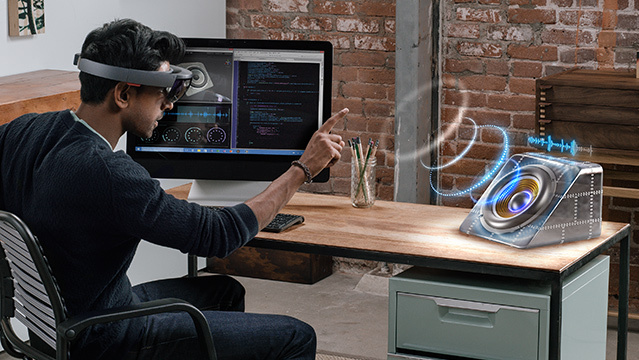 It will still take a few more years until we have a “HoloLens for domestic use”. Unfortunately to make the purchase must be in Canada or in the United States, because the only Microsoft online stores that have the product available are those two, at least for now. Anyway, before you had to be a Microsoft partner to buy the PC and now no more holographic.